You’ll notice that there are plenty of trends surrounding textiles and designs, but there are also some very hot ones based on colour. 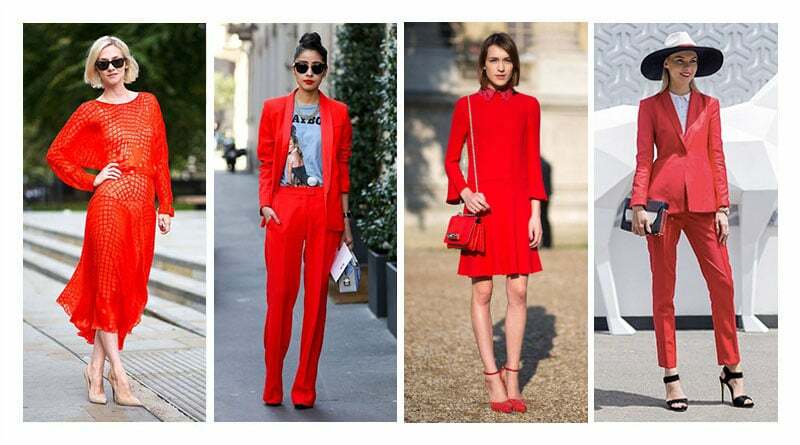 And in our opinion there are no colours as striking as red, head-to-toe red! Wearing red from head-to-toe is very glamourous and we saw this bold hue come on to the fashion scene last fall (seen on the runways of Tom Ford, Carolina Herrera, Helmut Lang, Tibi and Prabal Gurung and some of the most trendy celebs) and it has not disappeared yet! These strong colours make a statement all on their own which means that you do not need to go overboard on the accessories, keep your look simple and your accessories to minimum so that the bold hue is the focus of your look. Ditch the LBD and try the LRD! Some key pieces that you should try this season: A classic read blazer, tailored red trousers, turtleneck shirt, a full skirt. However, red is quite a confronting, vibrant colour, and is proven to arouse stronger emotions than any other colour (meaning you’re going to turn heads). So, if you don’t feel confident enough avoid this trend for now and rather try introducing a single red piece into your wardrobe until you warm to the colour and feel comfortable enough to pull of this trend in its entirety. Will you be adding some red to your wardrobe this season?